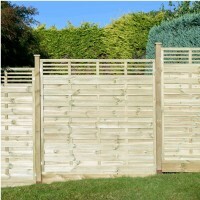 Why not finish your garden with the stylish European fence panels that we have available, the timber is planed and pressure treated and comes in a range of designs some of which include trellising, providing the perfect screening for privacy but also a stylish trellis so as not to block out all the natural light to your garden. 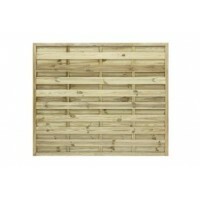 All of the European range fence panels are manufactured from selected softwood, the preservative leaves a light green tinge to enhance the decorative style and protect the timber from insect infestation, fungal decay and rot. 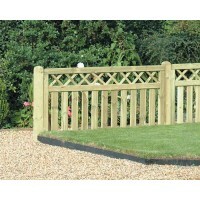 The light green colour will fade as the timber is exposed to weather conditions and further staining will be required to enhance the products appearance. 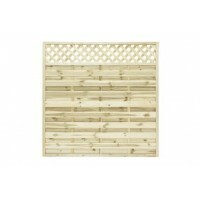 A attractive euro panel which is really good at maintaining an open aspect and for separating&n..
Pressure Treated Planed Green Timber 1.83m wide x 1.8m high ..
Elite St Esprit Fence Panel This treated european panel has a straight top, the panel provid..
Elite St Esprit Trellis Top Fence Panel This treated european panel has a straight trel..
Elite St Lunairs Fence Panel This treated european panel is has chevron style lats and a cur.. 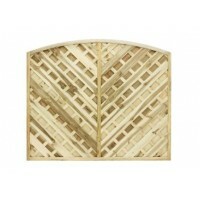 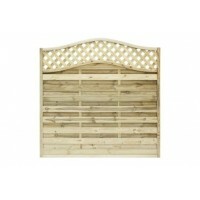 Stylish Fence panels, with a slatted trellis top, double sided panel will provide a contemporary fin..